by Shannon Clark in Pay Off Debt | 0 comments | Contains affiliate links. What an intriguing title. Curious, I couldn’t help but read on. Debt free. It’s one of those big life-changing projects that inspire us, right up there with “Save 98% on Groceries with Extreme Couponing,” “Potty Train your Toddler in One Weekend,” and “31 Days to Take the Jiggle Out of Your Wiggle.” They’re extreme, they’re exciting, and when you really look at what’s involved, a little overwhelming. Debt free in 2013, ya right, I thought. Does she have any idea how much debt we have and how small our income is? At the time I read it, I had absolutely no hope that our family would be debt free within a decade, let alone a year. Why even try? But Stacy’s post stuck in my head all year long, and in September we started our journey to becoming debt free! Three months later, we had paid off the first three loans in our debt snow ball, and we were more inspired than ever to tackle the last remaining big ‘ol grandaddy loan. It was time to get serious. We cut the grocery budget in half. We made plans to pay cash for a much older car when our expensive lease ended. I worked at nap time and after the kids were in bed growing my blog, marketing my book, and doing freelance work in my “real” career field of architecture. We made a list of every possible way to save money and did them, even doing a No Spend Month Challenge in January. We initially were on track to be out of debt within 20 months which was amazing to me in itself, but God has blessed our efforts and it now looks like it will take only take a total of 10 months or less. When we’re done, we’ll have paid off over $22,000 in student loan debt on a household income that (at the time we started) fit under the government’s low-income category for a family of four. Faster than I can possibly believe, our family has cut almost 5 years off our debt repayment, and we’re very much looking forward to enjoying debt freedom in 2014! If we would have started this amazing journey when I first read Stacy’s article, we really could have been debt free in 2013. If you’re like I was, in disbelief that becoming debt free could be a real possibility for your family, let me challenge you. Even if you start by putting only an extra $50 per month toward your debt, just get started! Every little bit gets you one step closer to financial freedom.So how about it? 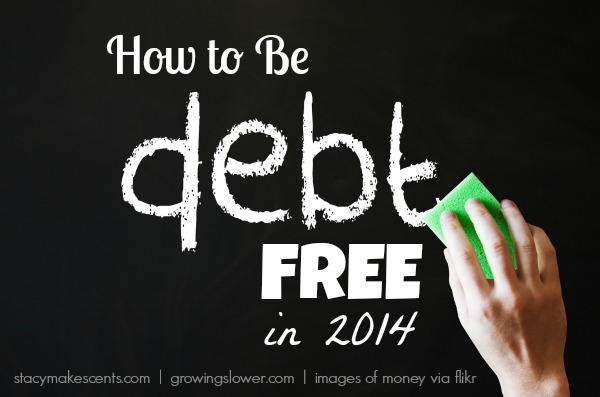 “Debt Free in 2014” has a nice ring to it doesn’t it? !